Al Harees is a traditional Arabic dish consisting of wheat, meat (chicken) and salt, is a popular treat during special occasions such as Ramadan, Eid and weddings. Harees is made by cooking ground wheat in a pot with a pinch of salt, to which the meat is added. The mixture is then left for many hours until it is fully cooked and the meat is completely dissolved into the wheat. The mixture is poured into a clay pot and placed in a clay oven or in a specially prepared hole in the ground that is filled with burning coal. After several hours, the thick mixture is removed and stirred with a special piece of wood called ‘midrib’. The final product is topped with local ghee and placed onto flat plates. Harees is a rich meal and is filling. 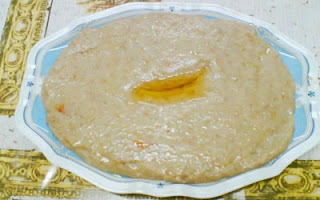 Although quite similar to the Armenian harissa, harees is more of a gelatinous dumpling than a porridge. Even though harees was once a traditional dish made at Arab homes, nowadays one can find it on the menu in some Arabic restaurants in Abu Dhabi, Dubai and Middle East countries.